Pasanday Cutlets recipe by Nazia at PakiRecipes.com. Combine meat, garlic , ginger , salt , chilli powder, garam masala and ajwain in a medium pot. Cook over low heat for about 15 minutes, or until meat is almost tender and water has completely evaporated. Transfer to a plate and keep aside to cool. Dip the cutlets first in egg, then coat with the bread crumbs. 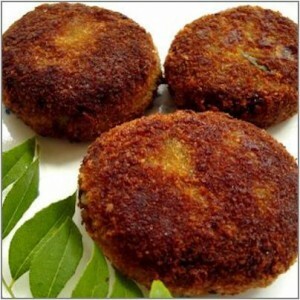 Heat oil in a frying pan over medium high heat and fry the cutlets for about 5 minutes or until golden brown. Transfer to a plate lined with double thickness of paper towels.